E-commerce in Turkey is growing and with a population of just under 80 million its e-commerce market is expected to grow. Marketplaces are widely used and the most popular shopping sites are GittiGidiyor, Hepsiburada, Araba.com and Trendyol. Apart from marketplaces, Whatsapp is widely used as a sales channel. With its internal e-commerce growth, Turkey has ambitions to grow its online exports, and this is in line with the Government’s export target of 500 billion dollars by 2023. To support this target, Kozadigital has been organising two-day export conferences, Eihracat17 , twice a year and I had the opportunity to speak at the latest conference. Held in Halloween week, this was a perfect opportunity to reach out to businesses which I may not have thought of otherwise. Thanks go to Salih Bosca for reaching out to me with this opportunity. It was interesting to find out Salih has been following our London Online Seller Meetup for the last 2 years and he saw a perfect collaborating opportunity. 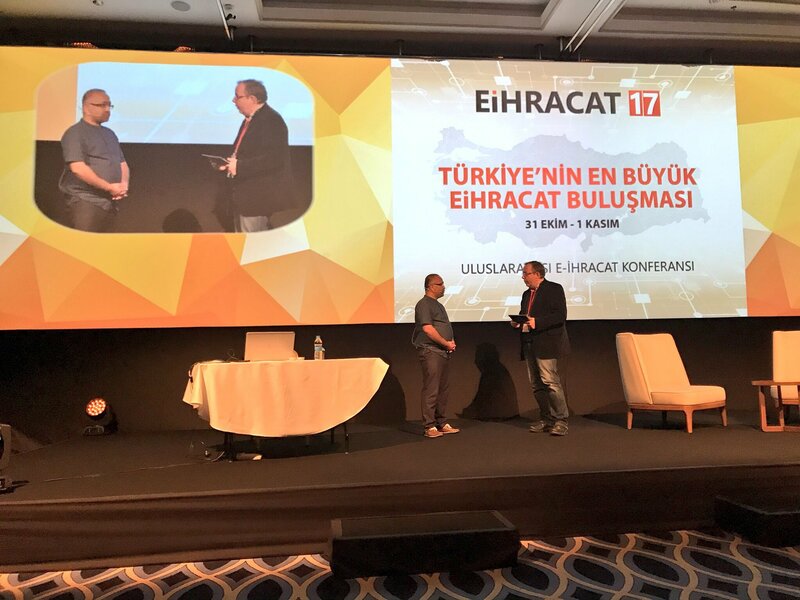 Personally, it has been a fantastic two days here at the Eiharacat17 Conference talking about how Turkish companies can export via Amazon and eBay. Company registrations and VAT were also on the agenda and detailed information is now available online. I felt that there are a need and a hunger for these businesses to learn more about exporting online. The conference was well organised with 200 attendees and there were talks on EU opportunities including in Ireland &amp; Germany, Multichannel Integration, logistics and payments. I enjoyed leading a 4-hour session on Amazon and eBay. It was my first international presentation and one with such a large audience. The audience was very attentive and took things seriously, with translations going on in the background. Both sessions were intensive so, there was also an opportunity in between to answer questions. Most questions were regarding logistics and payment as they are both the main barriers to entry. After the second day, we spent an evening discussing how the event can be improved for next time and there were quite a few suggestions to include digital marketing and more detailed sessions. So, I am hoping to that we would be able to organise some UK digital marketing experts to join the conference and share their expertise in 2018 alongside some full-day workshops. As with every conference, there was a good opportunity to meet various companies supporting e-commerce growth and below are some of the ones I met. #1 Copyrobo is a technology company that helps you secure your copyright anywhere in the world in less than 60 seconds. They use the world’s leading technologies such as Blockchain and Qualified Timestamps to help you prove and manage your copyrights. They designed Copyrobo to help you protect and, if you wish, share your creative content easily and securely. #2 Revotas was founded in Boston to provide e-mail marketing and database management services; multi-channel online marketing solutions with its powerful infrastructure. #3 Tsoft provides holistic support in e-commerce businesses. The company provides solutions from website development, search engine optimisation to payment solution. This all in one solution provider is the one place to go for Turkish businesses looking to export online. #4 Eticaretcagi is an e-commerce magazine supporting the e-commerce sector in Turkey, making informative and awareness-raising publications about the sector. #5 Yollando offers solutions to make it easier for those who want to live abroad and shop in Turkey. Simply shop online in Turkey and deliver your order to a free Turkish address, then your orders are forwarded to you wherever you live out of Turkey. #6 Ayen Software is the Turkish only software to provide integration with Amazon, eBay, Aliexpress, Pttavm, Gittigidiyor and others. It is a trusted software and brands like Toshiba, Karaca, Misirli, Aisha already use them for a multichannel integration. #7 Channel Advisor is a leading multichannel integration software helping online sellers connect to Amazon, eBay and hundreds of marketplaces around the world. In the last 10 years of my e-commerce journey, I have been to many conferences in the UK, and to be here in Istanbul was an absolute privilege. I feel encouraged and will be returning in 2018 with a few other UK digital marketing experts. We can help Turkish businesses establish a presence in the UK and Europe. We can help with logistics, payment and establish a company including helping with managing your Amazon and eBay accounts.